Most doctors will tell us that there is no known cause for canker sores, but alternative healers will tell us that the prime suspect is a 6 letter word with a very bad reputation-STRESS. With this in mind, all of us are then potential victims of canker sores. Our mouth, apparently is one of the first places that react to physical, mental and emotional stress. So you can consider a breakout in your mouth as a sign that you have extra stress in life. If stress is the cause then eliminate it. How? Consider stress relieving techniques like yoga, exercise, listening to favorite relaxing music, massage and a wholistic and fresh approach to life. This might be quite challenging since it’s a lifestyle change. For a quick fix for an already existing sore, try activated charcoal. Or if you already have a sign of a developing sore, immediately put a tablet on the area and leave it on inside the mouth for at least 15 minutes. It should remove the painful stinging sensation. The only drawback is that the area will be tainted black and you will have a dark stool. Nevertheless, everything will be fine. It’s good to keep tablets of activated charcoal handy for unexpected canker sores episode. To speed healing, consider taking zinc supplement. You can buy natural zinc supplement from health stores. 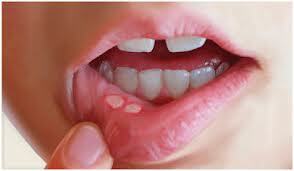 This mineral helps speed up healing and since canker sore is a wound, taking up zinc will surely make healing faster. Another natural cure that I have personally tried is bee propolis. While this is far from the yummy nature of honey, bee propolis with its black color and unpleasant smell is a winner for canker sore healing. This will help seal the nutrients and moisture so that the skin can heal faster. You can find this in health stores like GNC, Vitamin Shoppe etc. Don’t forget to have fun. I want to believe that canker sores are purely stress related. So having fun must be taken twice or thrice daily. Consider having a higher rating in fun rather than stress to be canker sore free.